• "If you want the best experience of this beautiful land, Hanoch is the guide to go with. He is very versatile. He will meet you at your level, haha even if you are 4 or 74." • "Thank you so much for all you've shared with us - my head is spinning! What an experience to connect with the land and the people. To see, to taste, to feel and to hear has absolutely been amazing!!" • "In July of 2014 our group had the pleasure of hiring Hanoch Young as a guide in Jerusalem. Hanoch was very well informed and humorous. He is a true patriot of Israel. He is tolerant of other points of view while very capable of explaining his own. His detailed knowledge of the Kotel and surround areas is astonishing. We will always use Hanoch for our tours there! We felt welcomed by Hanoch and he will be our friend for life! Do yourself a favor and hire him for a day. You will never see Jerusalem the same again. • "This summer (2014) I went with a group from the US to Israel and requested Hanoch be our guide for 2 days. I was a little concerned because our group was pretty diverse in their knowledge of Israel, physical capabilities, and ages. I am so grateful that Hanoch was able to "read" our group and was able to keep us engaged and moving!! This is what makes a great Tour Guide for groups...... someone who is able to "read" the group and meet the needs of people. We had varying physical capabilities and communication/learning styles and no one ended up feeling they had been left behind or bored. That is success in a tour!! Hanoch kept this group together, moving, and entertained with learning!!! I had asked Hanoch to take us to Hebron and Shiloh along with a day in Jerusalem and somehow "tie together" ancient and Modern Israel and how they relate and co-exist. I knew this was a big expectation with this itinerary but his insights and knowledge were able to do just that!! His personal stories and experiences in Hebron that he shared will not be forgotten.... they made it just that more memorable!!! . We also took a public Western Wall Tunnel tour with Hanoch although our group did not have any small children I was able to observe firsthand how he interacted with them during that tour. So, if you have children that need help to keep their attention (sometimes historical things for kids are boring. ) he has learned how to make them part of the experience/group and keep them interested AND he did that feat without the adults feeling like they went on a tour with BORED children......... that is no small accomplishment !!" • "This is a long overdue recommendation for our tour guide Hanoch Young on our recent trip to Israel. I would like to tell anyone looking for a tour guide in Israel to consider fitting Hanoch into your trip! Hanoch was very courteous, and personable and a most excellent tour guide. He was able to discern the level and depth of the tour we needed at the places we visited and was able to keep things moving smoothly. Hanoch clearly has a lot of experience and knows factual information in regards to dates, history and current events. And on a personal note, Hanoch has a clear pride in his country and the people that almost makes my heart hurt. He answered all of our questions and it was a privilege to hear the information from a local. All in all, Hanoch was an excellent guide in Israel. Thought I would pass along the rave to anyone who is trying to find someone great for their time in Israel. Happy Travels!" 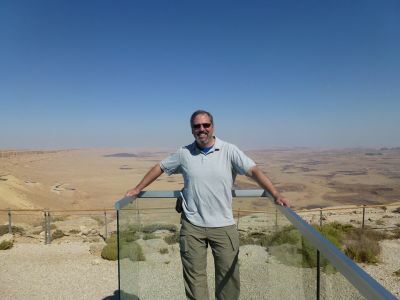 • Hanoch is a rock star of Israeli tour guides! He has mastered the art of story-telling and brings all aspects of Israel to life with his enthusiasm (which is contagious). Hanoch has the amazing ability to share his wisdom and knowledge with authenticity, charm and humor - so that we understood the history, symbolism and importance of each site we visited. His heightened energy, enthusiasm and engaging approach coupled with his passion for Israel's promising future is an inspiration. As we strolled through Jerusalem his genuine personality was even more impressive through his interactions with friends and acquaintances. (Everyone knows Hanoch!) Because of Hanoch’s intrinsic bond with those who feel a deep connection to the Land of Israel, you will leave even more committed and dedicated to Israel.